It’s every business owner’s dream to have a flexible work schedule, work close to home in a tight-knit community with family…. and to set up shop in a water park, right? Well, maybe not everyone loves the smell of sunscreen and children’s laughter while they work, but for Nocatee resident Rocky Leary, he’s living the dream. 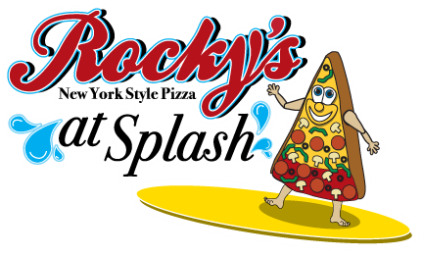 The owner of pizza parlor Rocky’s at Splash, Rocky knew opening a shop in a strip mall wasn’t for him — so why not a water park? Originally from Brooklyn, Rocky has owned his New York-style pizza business for 21 years with three shops in Vermont before moving to Florida four years ago. He now focuses full-time on his Nocatee Splash Water Park location. In addition to his pizza shop, Rocky has an ice cream truck that he uses for special community events like movie nights, fall festivals and Food Truck Fridays. The family-centered pizza shop owner was drawn to Nocatee for his business and home because of the top-notch schools, proximity to the beach and the “just-right” feeling his whole family felt when touring the area. He loves that his family doesn’t have to leave what he calls “the bubble” to enjoy entertainment, pools, nature and community, let alone his work: “You almost feel like a pioneer being part of a community that is so close-knit and growing into its vision,” Rocky says. He is excited that his pizza shop is a part of Nocatee’s ongoing growth. His favorite thing about being a local business owner is working at a place where people feel like they’re always on vacation. He loves that he and his wife, Lisa, get to run their business together and teach their children the values of teamwork. Their 13-year-old daughter and 8-year-old son enjoy the lifestyle that comes with growing alongside the family business. He also believes it is important for business owners to give back to the community whenever possible. He frequently donates portions of his revenue to local nonprofits and school parent teacher organizations (PTOs). Rocky is a great asset to the First Coast area in more ways than just making quality pizza — he’s a caring neighbor who is focused on impacting the community one slice at a time. ∗ Rocky’s story is the first in a series of posts featuring local entrepreneurs who call Nocatee home.